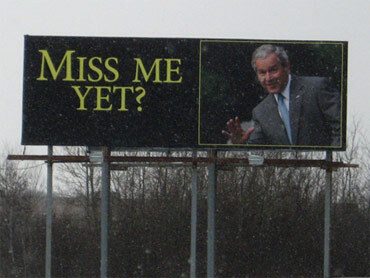 The cheery image of former President George W. Bush appeared on a billboard in Minnesota earlier this month, next to the words, "Miss me yet?" It appears a lot of people think it's a fair question. The online store CafePress saw a spike in demand for items featuring the same image as the billboard, the New York Daily News reports. Ten "Miss Me Yet?" items were on the company's list of its top-selling designs, CafePress spokeswoman Jenna Martin told the Daily News. "There were no Obama-themed designs on the list," she said. "Bush has stolen the political spotlight, just like Sarah Palin did the week before when she re-surfaced with crib notes written in her palm." Obama-themed merchandise saturated the Washington area around the time of the president's inauguration last year, but by the fall, the enthusiasm for Obama caps, t-shirts, commemorative plates and so forth, seemed to fizzle. U.S. News and World Report noted earlier this month that even the Obama Store, located in tourist-filled Union Station, has closed, in what "may be the most tangible sign yet that the [Obama] honeymoon is over."